Yes, its true. Precious metals manipulation has taken place, but the real reason may not be fully understood by either gold and silver investors or their critics. Lately, I have seen many articles written about this subject. Even though some articles offered some interesting insight and data, there’s also a lot of misinformation as well as name calling on both sides of the discussion. While I enjoy using the term “POOR SLOB” on occasion, I used it as a reference that a top ranking banker may see the typical middle class person. That being said, the personal attacks used on both sides of the aisle tend to make the rift even larger. This is why I try to focus on the information and data, and let individuals make up their own minds. Before I get into the real reason for precious metal manipulation, I need to address the motivation behind this article. Let’s start with a quick update of the silver market. Concerned about a contagion stemming from a possible Greek Exit in June, the collapsing Chinese Stock Market in Jul-August and the forecasted crash of the U.S. markets in Sept-October, investors purchased a record amount of silver bullion including a surge in physical gold investment. This surge in physical silver investment caused a shortage in many retail products pushing up premiums and delivery times to more than two months. I stated in several articles and interviews, that if we did see a continued crash in the markets or black swan event, the silver product shortage could extend into the broader wholesale market. This did not occur as the U.S. markets recovered, gaining back the majority of losses in a little more than a month’s time. Amazing the kind of market move that can be accomplished with digital Dollars courtesy of the Federal Reserve. Currently, premiums on silver retail products continue to decline as wholesalers and retailers get caught up on back orders. Some analysts and commenters offered criticism by saying a silver shortage isn’t a shortage unless it makes its way into the wholesale market. While that might be true, when it occurs… it will be the first time in history. 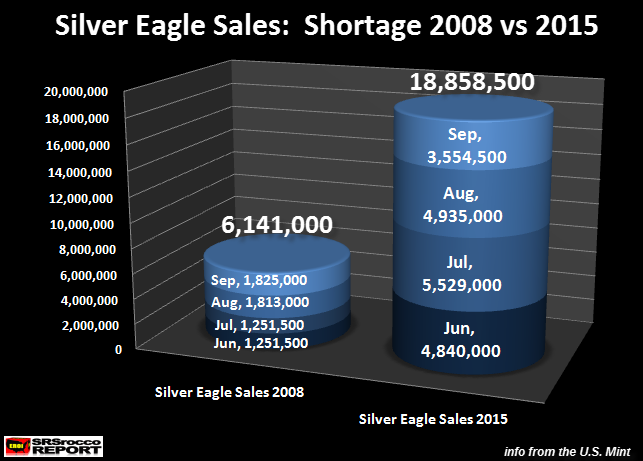 Furthermore, a wholesale silver shortage will likely destroy the highly leveraged futures market. I would imagine that would cause a great deal of pressure on the silver price… pushing it up to levels unimaginable today. When I made this chart, I assumed that 1% of investors in the world purchased the 196 million oz (Moz) of silver bar and coin in 2014. However, further investigation puts the realistic figure closer to 0.5%… yes, a half of one percent. 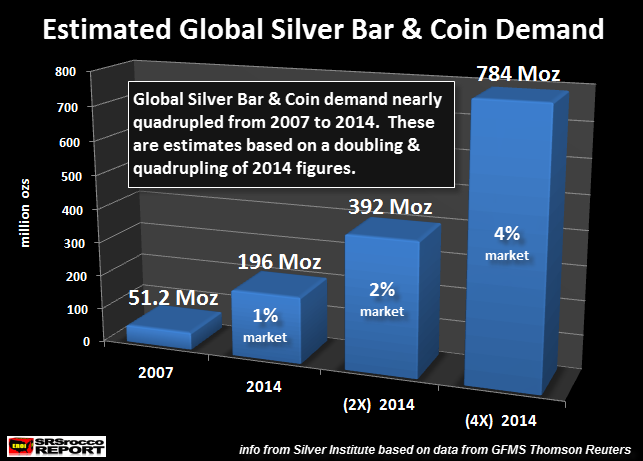 So, just a doubling of silver bar and coin demand of 196 Moz in 2014 would equal 392 Moz. According to official sources, the highest annual figure for silver bar and coin demand was 244 Moz in 2013. Which means, a doubling of the 2014 figure of 392 would be almost 150 Moz more silver bullion than the 244 Moz record in 2013. That would just about empty the total silver inventories (163 Moz) at the Comex. Moreover, if we had four times (0.5% X 4 = 2%) the 2014 bar and coin demand, it would equal a stunning 784 Moz. This would totally obliterate the silver market causing the price to skyrocket. However, I don’t think it we would need to see a doubling or quadrupling of investors in silver bar and coin demand to witness an explosion in the silver market. Why? Because a relatively small group of large institutional investors worried about the coming collapse the stock and bond markets, could easily acquire 200+ Moz of silver at a paltry $3.2 billion (based on $16 price). The real fireworks will begin when a surge in silver bullion demand takes place by the management of institutional portfolios. The motivation to write this article stemmed from a recent piece called Market Manipulations: The Greatest Scam Of All Time by Martin Armstrong. While Martin’s title refers to market manipulations in general, he focuses his text on the precious metals… especially silver. Throughout history, there has NEVER been a market manipulated TO ALTER its long-term trend – PERIOD. If this were remotely true, then communism would not have collapsed since that was the attempt to eliminate the business cycle. The Swiss peg would not have collapsed, nor would Bretton Woods have collapsed, or anything else in history that has attempt to eliminate the business cycle. Martin says a market manipulation can’t alter its long term trend, because if it were true, communism wouldn’t have collapsed. Well, Martin was correct, the Soviet Union collapsed after 67 years (1922-1989). However, 67 years is a long time. I would suggest that the Soviet Union surviving 67 years by attempting to eliminate the business cycle was one hell of a LONG TERM MANIPULATION. Now, I am not saying I agree with Martin’s assumption that eliminating the business cycle destroyed the Soviet Union, rather I am pointing out that 67 years is what I would label as long-term in my book. Furthermore, the lifespan of the Soviet Union, makes the 44-year-old U.S. Fiat Dollar World Reserve Currency (starting in 1971 when Nixon dropped the Dollar-Gold convertibility), quite a young lad in the whole scheme of market rigging or manipulations. We’ll getting back to the subject of precious metal manipulation, but we need to explore the topic of Fiat money (paper money). Money Can Be Anything… Or Can It? This theory that MONEY must be tangible destroys all freedom. It is nonsense. You hedge government with your assets. MONEY is not a store of value for it rises and falls in purchasing power with the booms and busts. Just because precious metals were used as coins at various times, does not support this idea that money must be tangible. There have been hundreds of yearly intervals where money was NEVER precious metals and what about Asia where China never issued precious metal coins. They proved money is simply what everyone agrees to have value. St. Patrick wrote how the Irish used slave girls – not precious metals. The reason the early Chinese Dynasties did not produce many gold or silver coins was due to its rarity. Instead the ancient Chinese used iron and copper coins as a medium of exchange because they were able to produce these in much higher numbers as the annual production of silver was quite low. For example, during the Chinese Tang Dynasty (618-907: Wikipedia), the annual silver production was approximately 25,000 teals. One teal equals 1.21 oz. Thus, 25,000 teals of silver production, equaled 30,250 oz per year. This is an insignificant figure when we compare it to the production of silver in Ancient Greece from 600-300 B.C., which was estimated to be 25 million oz…. 80-100,000 ounces per year (U.S. Bureau of Mines-Summarized Production of Silver). During the time (600-300 B.C.) when the Ancient Greeks were producing silver from their massive deposits outside the Laurium region in Greece, the population was approximately 8-10 million. They produced enough silver to supply each Greek citizen with 2-3 oz each. This is just an estimation. Now compare that to the Chinese Tang Dynasty, nearly one thousand years later, that only produced 30,000 ounces of silver annually at a total of about 9 million ounces over the 300 year period (618-907) for a population of 50-80 million (Wikipedia). Here we can see, that silver was too rare to be used as a form of currency for the typical Chinese. However, later on, as technological improvements in mining and smelting advanced, China produced a great deal more silver and its importance grew as a currency and medium of exchange. So, the 700 years of Wuzhi coins came to an end, where the value of the coin was simply value of the metal it was made from. The new coins were in use for 200 years and used in Japan, Korea and Vietnam. By 850CE (Tang dynasty) eight copper mines provided all the copper for coinage. A hundred mints busily produced 327,000 strings of 1,000 cash coins. Each string weighed 6.4 pounds and was roughly equivalent in value to a liang (an ounce) of silver or a bolt of silk or a bushel of grain. Coinage began to generally replace the ‘bolt of silk’ as a unit of currency. If we assume a string of cash coins consisting of 6.4 pounds of copper, that would equal $14.21 based on today’s copper price ($2.22 lb). Thus, a string of Chinese copper coins worth $14.21 today (metal value only), would nearly equal the present price of an ounce of silver at $14.95. So, here we can see that even in ancient China, coins were a store of value based on their metal content. When the empire decided to adopt the paper note policy of its former enemies- the Southern Sung and Jin  the circulation of silver began to be restricted or even banned. However, this temporary setback did not cause silver to lose its attraction; the unlimited issuance of paper notes by the empire created serious inflation, and as a result, through the remainder of the Mongol Empire, silver was used by people secretly and privately instead of the devalued paper money. People never gave up using silver, since the paper money was debased, and they even resort to barter rather than using paper notes. This situation lasted for several decades until the silver ban was abolished by emperor Yin Zhong (1435-1450, 1457-1464). Silver was once again widely circulated in China, and almost all the surviving Ming silver ingots date from that time. According to a historical record, officials of late Ming period received their salaries 10% in cash coins and 90% in silver, and all levels of Chinese people conducted transactions using silver. If the value of ancient Chinese coins was tied to the content of the metal, let’s compare it to the present day U.S. currency. According to the Fed, the U.S. Treasury Bureau of Engraving and Printing produced approximately $111.4 billion worth of Federal Reserve Notes and the U.S. Mint supplied $783 million in coinage in 2014. The chart above reveals just how much more paper currency (in face value) was produced compared to U.S. coins. What’s even more fascinating is the difference in cost producing paper money versus metal coins. 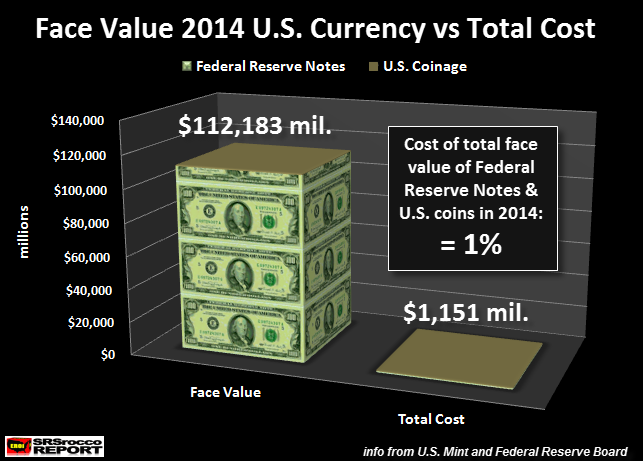 Total cost to produce $111.4 billion worth of Federal Reserve Notes in 2014 was $657 million compared to $494 million to mint $783 million worth of U.S. coinage. Basically, it only cost 1% ($1.2 billion) to produce the total $112.2 billion worth of U.S. paper and coin currency in 2014. I would imagine the ancient Chinese would be quite jealous of this sort of money creation. That being said, let’s get back to the subject of precious metal manipulation. This theory that MONEY must be tangible destroys all freedom. It is nonsense. You hedge government with your assets. MONEY is not a store of value for it rises and falls in purchasing power with the booms and busts. I would imagine the assets Martin is talking about are the typical stocks, bonds, U.S. Treasuries, commodities and etc. Let’s exclude commodities and focus on the remaining paper assets. As we can see in the chart, the total value of the U.S. Retirement Market is nearly $25 trillion. These are supposed assets, but as I have stated many times before, their value is based on the burning of energy. And not just energy, but a growing energy supply. What we really have here is a huge IOU based upon burning future energy supplies to be able to pay back or liquidate these U.S. Retirement Assets. This is also true for the majority of paper assets held throughout the rest of the world. Unfortunately, Martin Armstrong fails to consider PEAK OIL and the FALLING EROI – Energy Returned On Invested in his computer pi-cycles programs. This is a real problem because U.S. oil production is headed towards a rapid decline. The reason only 1% of the Bakken is breaking even is due to its low EROI. Shale oil in the Bakken has an average EROI (Energy Returned On Invested) of 5/1. It takes 1 barrel worth of energy to produce 5 barrels for the market. Now compare this to U.S. domestic oil production EROI in 1970 at 30/1 and in the 1930’s at 100/1. Even though the U.S. Suffered a Great Depression in the 1930’s, many companies still made profits due to the fact they were producing 100 barrels of oil at a cost of only 1 barrel. Bakken oil production needs high prices to be sustainable due to its high decline rates and very low 5/1 EROI. In addition, the majority of companies producing oil in the Bakken from 2011-2013, when oil prices were above $100, didn’t make much money (profits) as their huge annual capital expenditures had to pay for continued drilling. Again, the Fed propping up the banks and the market with $trillions in liquidity while lowering interest rates to zero allowed Americans to continue buying things they couldn’t really afford and allowed the shale oil companies to service their huge debts with extremely low rates. The world is sitting on a mountain of debt and paper assets. Both need a rising energy supply to be paid back or liquidated. The coming collapse of world economic activity will destroy the ability for the public and private oil industry to produce expensive oil… thus production will fall considerably. As oil production continues to decline in the future, it will put severe pressure on the very assets Martin Armstrong believes are better owning gold or silver. The real reason for precious metal manipulation is the funneling of the world’s wealth into FINANCIAL ASSETS, rather than physical assets such as gold and silver. Of course, financial assets did make sense for quite a while as Global oil production continued to increase. However, PEAK OIL IS HERE. 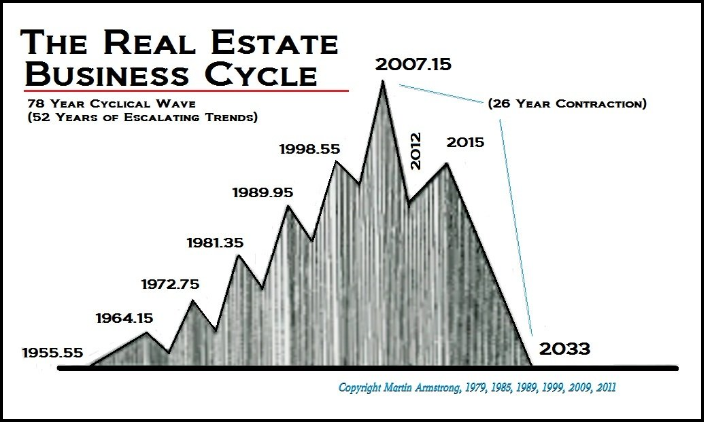 Martin shows the Real Estate Cycle topping in 2007, falling briefly to 2012 and then rising to 2015 before crashing all the way down until 2033. I see a similar pattern, but not due to just a cycle chart, but because U.S. domestic oil production will likely be down 80+% by then. 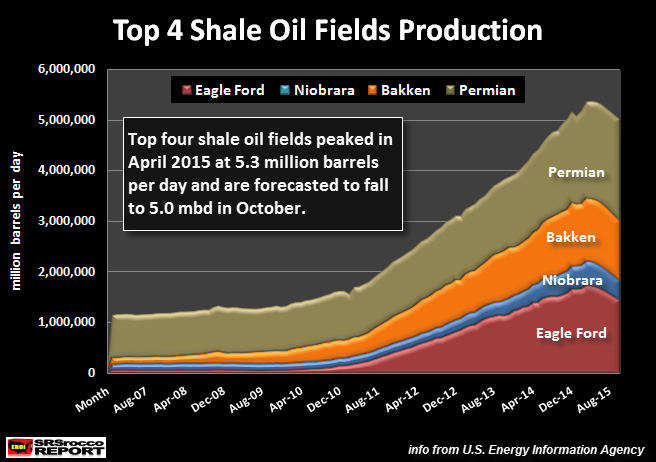 If the U.S. is producing more than 2-3 million barrels per day by then, I would be surprised. The coming collapse of the U.S. Real Estate market will not be due to a cycle chart, but rather the massive decline in domestic oil production, including coal and natural gas. Some readers may think this is absolute nonsense, but I can assure you, it isn’t. There are many analysts out there who continue to believe that there is all this untapped oil in the United States or abiotic oil that continues to refill oil fields. Well, if that was true, the EROI of U.S. oil production would have not fallen from 100/1 in the 1930’s to less than 10/1 today… with the average Bakken well at 5/1. Unfortunately, individuals who are presented this simple logic still adhere to crazy conspiracy theories. The think the elite are hiding oil in untapped oil fields in Alaska and etc. Don’t they realize there are thousands of private oil geologist who can read oil field maps and underground geology? The problem with most of the complex analysis done for large investors, institutions and hedge funds, it excludes the impact of falling energy production on most assets going forward. This isn’t surprising as returns or profits are based upon quarterly analysis. We are heading into a future that we have no experience. 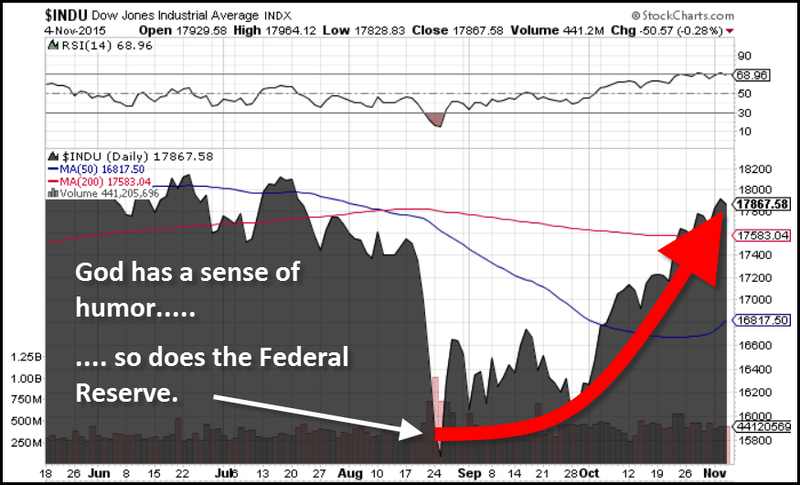 It goes well beyond the forecasting of cycle charts. When I visit large cities, I wonder what it will look like in say 5, 10 and 20 years. How do you run Chicago, Manhattan, Dallas or Los Angeles on a fraction of the oil we are using currently? Precious metals values have been manipulated for many decades. While some analysts such as Armstrong believe long-term manipulation of a market is impossible, I bring up the example of the Soviet Union. The Soviet Union lasted 67 years even though it eliminated the business cycle… stated by Armstrong. The value of precious metals are extremely undervalued due to the fact that investors have been hoodwinked into holding DIGITAL WEALTH & PAPER ASSETS. 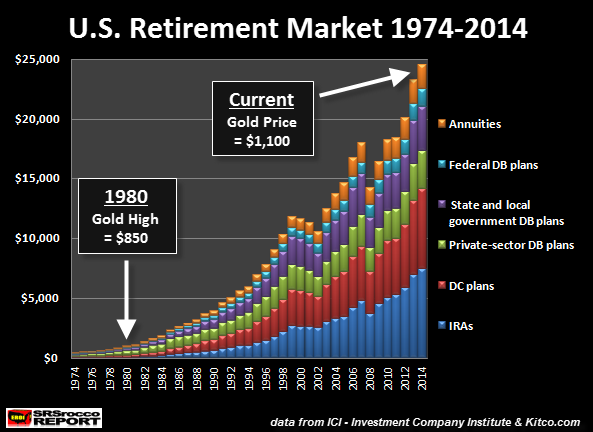 The massive siphoning of investors funds into financial assets over the past 40+ years severely depressed the demand for physical gold and silver. Unfortunately, no one is informing investors that financial assets are FUTURE IOU’s based on the burning of energy. Highly intelligent analysts and investors tend to look at the world with blinders on. They don’t consider the entire picture. Lastly, declining energy production including the falling EROI will destroy the valuation of most paper and physical assets. 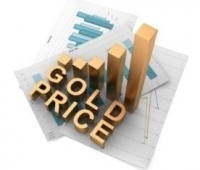 Gold and silver will be two of the safest stores of value to own in the future. I have no idea how high the value of these metals will reach, but they will vastly outperform the majority of most stock, bonds and real estate.